Naming a painting is always a bit troublesome to me and when I name my own work, I resort to chance to find a title. 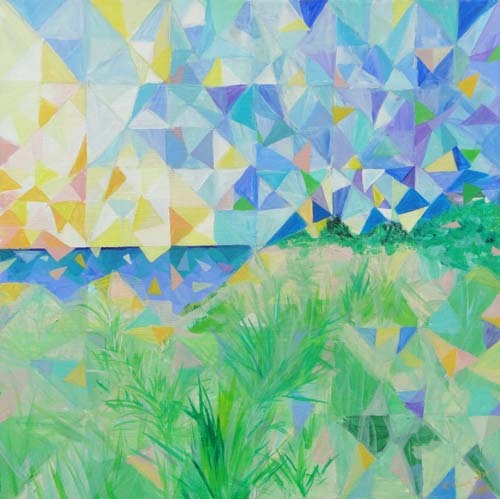 In this case, this painting by Kathleen Q., I would not want to be in charge of the naming department and Lake-Sky-Triangulation is merely a placeholder. I don’t know what the artist/student will call it. She finished it at home after a fellow student suggested that the triangles also sparkle in the lake. More triangles also trickled down into the dune-and-grass part. “Sparkle” and “trickle” are superficial, make-shiift, descriptive terms. 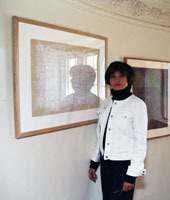 The artist herself thinks on a philosophical and poetic plane. The painting, 16” x 16”, is riveting. I’ll say no more and instead refer the reader back to posts 7.9.11 and 7.18.11 for discussions of the evolution of this work.